Finally, cleared all your papers in Engineering and other IT courses. Congratulations dear friends! Furthermore, you may have applied for several jobs but would’nt have got one. 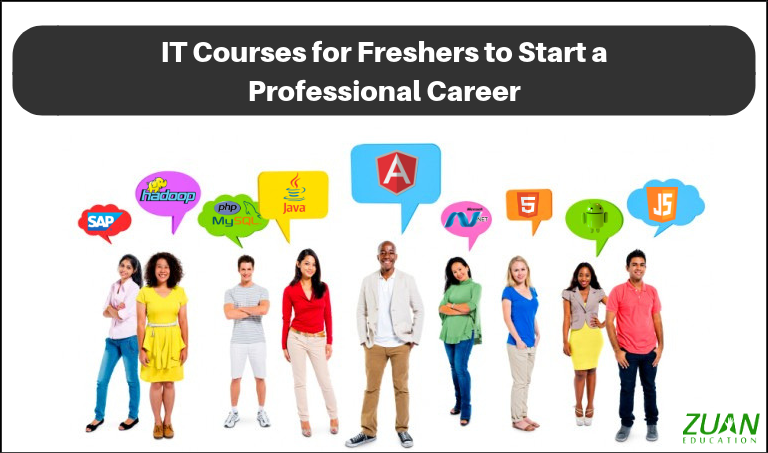 This article suggests a few IT courses for freshers like you to set foot in a job soon. These IT courses for freshers will open to you a lot of job opportunities. Moreover, enrollments for a job oriented course is increasing day by day. Doing such certification courses offers practical job skills in large numbers. Significantly, you have the opportunity to master a specific skill and apply for targeted jobs. So let us have a look at those short term IT courses for freshers like you. Youth like you use lot of apps. Like, Snapchat, Clash Royale, Color Switch, SoundCloud, Tinder, Vine, etc. Can you imagine a life without smartphones and useful apps. No not at all. Therefore mobile app developers have a great economic future. Significantly, if you can build apps for others you have a greater advantage. That is you can build and sell your own as well. Therefore it is an ideal career path for aspiring freshers like you. Mobile app development is important among the IT courses for freshers. You can learn mobile app development course. There are many IT institutes that offer such professional courses in cities and towns. These institutes offer a lot of software courses and other job-oriented courses too. In the month of February 2019, there were 51,181 mobile developer jobs posted on Glassdoor. Furthermore, the global app economy is predicted to be worth $6.3 trillion by 2021. The future of mobile development is also found in wearable technologies, the Internet of Things, beacon technology, an increase in the use of VR/AR, and more. This is another important programming language among IT courses for freshers. You must have heard about this computer name very often. Java is a computer programming language. This course is important among short term courses after your UG degree. Learning Java will help you to even work in a part-time job when you do your PG. Moreover, you will learn, Professional Java code writing by using best practices in the industry and thereby developing desktop apps. Specifically, this course is only for 60 Hours. As a Java Developer, you will be hired in Startups, small companies and in MNCs. You know, your average pay as a Java Software Developer / Programmer in India is Rs 434,304 per year. You will be wanted if you have digital marketing skills by a company. You will work in a company to improve its web presence and visibility. This is one of the tech skills in demand for obvious reasons: more site visits mean more buyers, customers, and revenue. It is a vital area among IT courses for freshers. If you have a love for data analysis, this course will be a best fit for you. While in the job you will be constantly testing, measuring, and experimenting. In order to see what works and make changes based on observations/metrics/KPIs. When I wrote this article Naukri had posted 1,2,590 job vacancies for SEO and 4971 vacancies for SEM. Now don’t fear the word “Marketing”. This word takes your thoughts to the person wearing a tie and marketing goods from house after house. No, no it is not that. This course is only for 80 Hours. Furthermore, it is a vital skill set among the IT courses for freshers. This is a vital course among IT courses for freshers. Let us take for example your family runs a big supermarket in the city. You want the online users to know about your supermarket. So what will you do? You can advertise your business on Facebook, Twitter, and other social networks. This will reach many young people. Furthermore, posting regularly about your product sale will get more customers for you. Therefore this marketing through social media channels is called Social Media Marketing. In your management courses, you would have learned a subject on Business Analytics. And you may be thrilled about using those analytical skills to earn money. Furthermore, a point to mention here is that Google Analytics is a great tool that gives insights into your digital marketing activities in a company. Moreover, it is essential to creating a successful online presence. If you are a creative person equipped with the right skills. Then you can land in a creative director/content development manager job. Moreover, Web Designing is one among the prominent short-term IT course for freshers. Furthermore, in web designing and web development, you will learn the skill of producing and maintaining websites. Likewise, skills in web designing course are interface design, graphic design, web graphic design, user experience design, and SEO i.e. search engine optimization. Moreover, the fees for this course starts from Rs. 14,000 onwards. Markedly, the salary you will draw after finishing this course is between Rs 3-9 lakhs per annum. UX Design Course provides you with the best practices of building a web designs structure. Particularly, elaborating its concepts. Also, authenticating its user experience in a prototype. This is one of the best courses after Engineering. Furthermore, it is among the job-yielding IT courses for freshers. Understand the process of designing a website or any other web application. After doing this course you will end up becoming a UX Designer. Learning courses like SQL, C, C++, HTML5 from leading IT institutes will make you a real-time programmer. They are the key short term job oriented courses freshers like you. The starting rate to do these course is Rs. 5000 and above. Especially, you learn a lot of techniques like Datatypes and Operators, Arrays, HTML5 Semantic Tags etc. Equally, you can find yourself landing in a lot of careers like Software Developing and Web Developing. So, friends, you can choose from any one of the IT courses for freshers. These Information Technology related courses such as programming languages, designing and development etc will fetch you high paying jobs in the industry. Along adequate communication skills are also needed. It will be good if you do these courses from private professional institutions. You can meet them personally and have a group discussion to check which course will best suit a fresher like you. Best of Wishes in Choosing your Right Career Course.